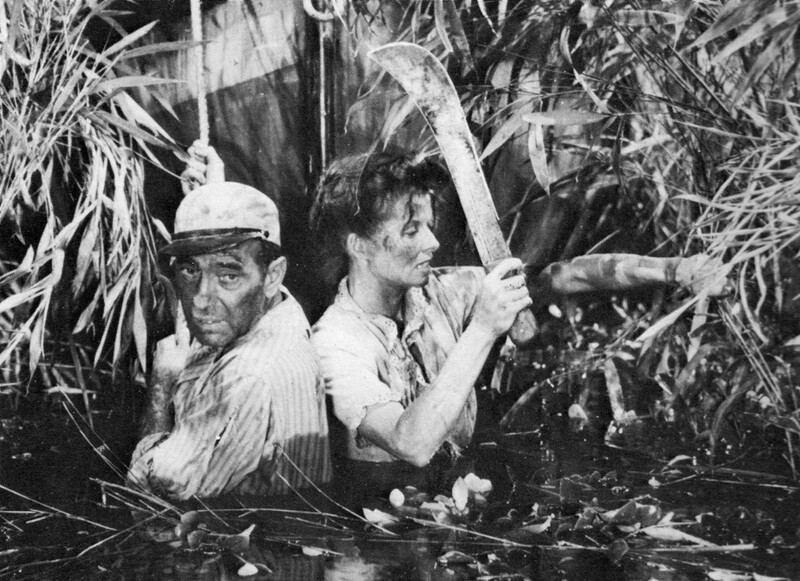 Philip Blair and Mary Pat Rowan on their first trip to the Soldiers’ Home (à la Bogart & Hepburn) . Saturday, May 4, 1 p.m. to 5 p.m., on the lower grounds of the Armed Forces Retirement Home, Rock Creek Church Rd & Randolph St., NW, Washington, D.C.
60-minute nature walk of the Home’s lower grounds with Brookland landscape architect Mary Pat Rowan, starting at 2 p.m.
Children activities and prizes including toy boat races on the Soldiers Home pond! Local food vendors — he’s back, Captain Cookie and the Milk Man, home-made ice cream sandwiches to die for; The Big Cheese, try the Mt. Fuji with MT tam brie, fuji apple, honey on multigrain; DC Ballers, serving falafel & fries with different dipping sauces. Local craft beer from DC Brau. Carnival Games: Bocce/Volleyball/Football Toss/Horse Shoes/Baseball Throw/Golf Putting Mats and More! A tent where you can play many of your favorite board games. This is a FREE event, rain or shine, $5 charge per car for those who drive in. Friends of the Soldiers Home is grateful to our friends at the Soldiers’ Home for assisting with this wonderful event that will benefit Home residents and the community. It’s time for our April Happy Hour at the Old Soldiers Home – don’t know if we can top the huge success of March, but we’d sure love to try! We are seeking volunteers to help us host a Happy Hour with our veteran friends next Tuesday, April 30th, from 6 p.m. to 8 p.m.
We also need volunteers for Spring Fling on May 4, 1 p.m. to 5 p.m., on the Home campus. Volunteers who agree to give us two hours will get a free red Friends of the Soldiers Home t-shirt to wear at the event! We need people to help with directing parking, setting up, helping with kids games, serving drinks and picking up trash. Please contact Mary Bucci at volunteerfriendsofsoldiers(at)gmail(dot)com if you are free for either of these volunteer opportunities. All of us from Friends of the Soldiers Home are looking forward to seeing old Friends next week and to meeting new Friends as well! 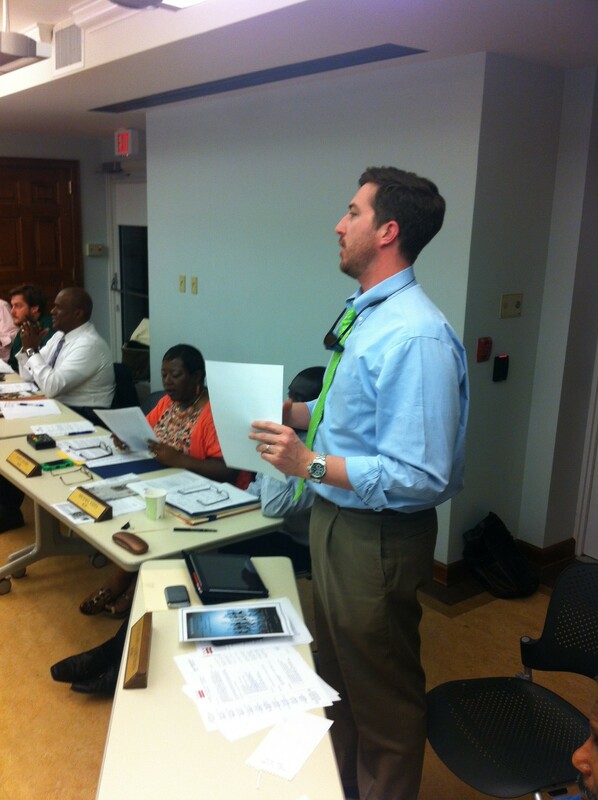 Friends of the Soldiers Home Board Member Zachary Hartman speaks to the ANC 4C Commission about the non-profit group’s request for grant support (photo by Joseph Martin). Friends of the Soldiers Home is grateful to receive a $500 grant from Advisory Neighborhood Commission 4C in Washington, D.C. The grant will assist with a portion of the cost of filing fees for the effort by Friends of the Soldiers Home to gain 501c3 status. The Friends of the Soldiers Home is very much appreciative for the support of the ANC 4C Commission, which approved the grant at a meeting earlier this month. 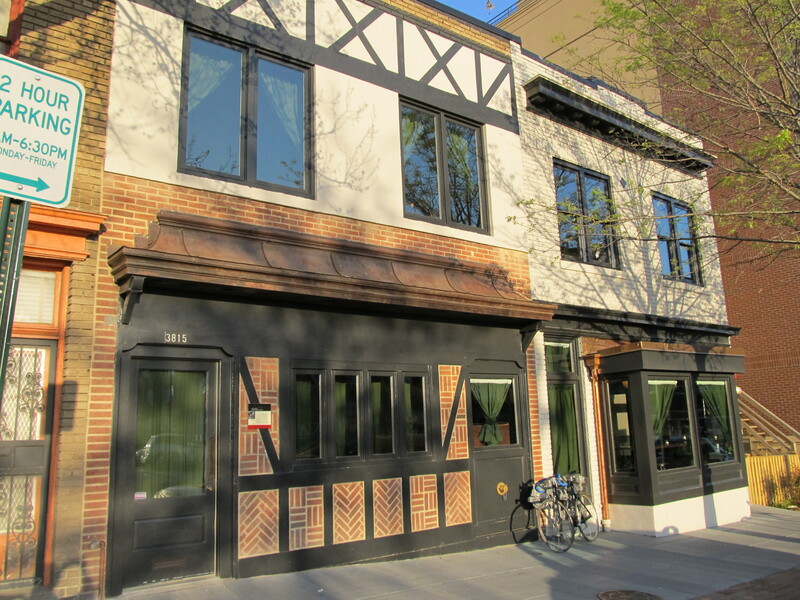 Chez Billy’s at 3815 Georgia Avenue, NW. 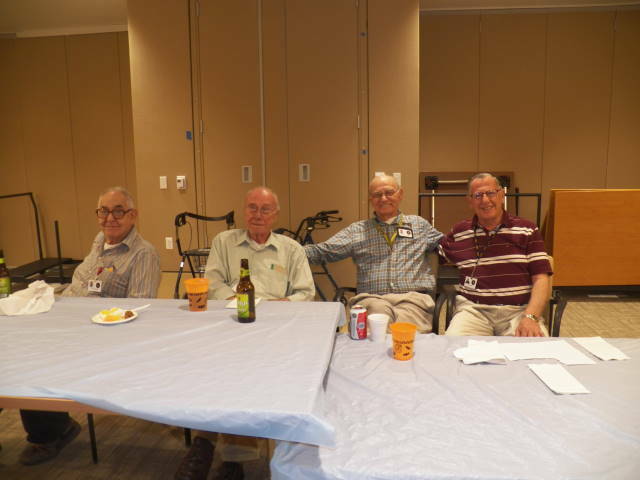 Friends of the Soldiers Home had a terrific event at Chez Billy’s on April 18 that brought neighbors and friends together for fun, fellowship, and fundraising. We accomplished our goals with flying colors! Along with the over 75 friends who supported the event, we had six residents of the Armed Forces Retirement Home join us. The residents of the home and the friends in attendance were able to share stories and conversation, as well as start and foster friendships. Thanks so much to Chez Billy’s for hosting this wonderful event and to all of our friends (and their friends) who came to support. Don’t forget about our Spring Fling taking place at the Home on May 4th. This will be another great event for the community, complete with games, music, food, drink and fun. Don’t forget that this Thursday, April 18th, from 6-9 p.m. the Friends of the Soldiers Home is hosting their Happy Hour for a Cause! The event will be held at Chez Billy, 3815 Georgia Avenue, with the goal of raising funds to continue the organization’s work to foster friendship between the community and the Armed Forces Retirement Home as well as support the May 4th spring festival on the AFRH’s grounds. This month’s Jingo made for a really nice night for residents of the Armed Forces Retirement Home and Friends of the Soldiers Home. We had nine volunteers and 10 residents; a perfect match-up for the game. 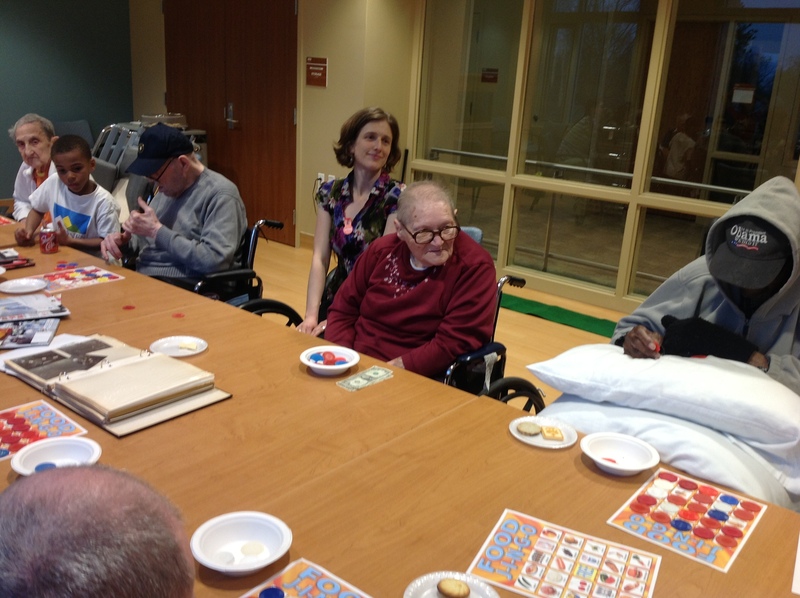 Ms. Ida won the first four Jingo games; boy was she thrilled! She calls volunteer John Lincoln her lucky young man when he pairs with her for this game. Mr. Tillery won next (and celebrated by singing a little Sinatra) and then Katie took it all home! Thanks to all our great volunteers who came out that night — our veteran friends appreciated it very much. AFRH Spring Fling — May 4th, Rain or Shine. 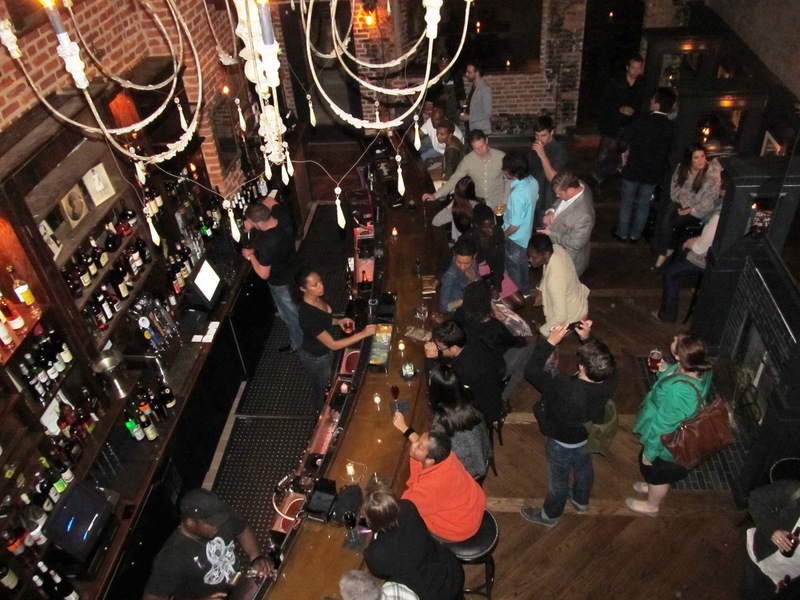 Resident Ray Anderson provides the music at Happy Hour March 26. 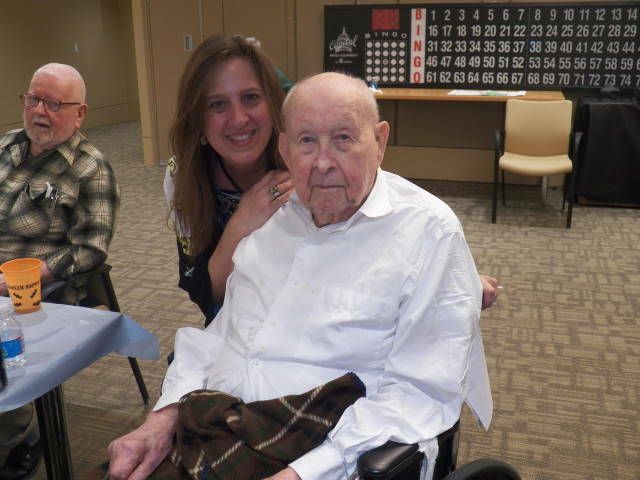 We had the best Happy Hour in memory at the Armed Forces Retirement Home on March 26. More than a dozen Friends of the Soldiers Home volunteers were happy to assist wheelchair residents in getting to the event. Friends also served everybody cold beer, other drinks and snacks, and shared some smiles and conversation. Both assisted-living and independent-living residents attended in the community room in the brand new Scott Building. Everyone seemed like they had a really good time. Ray Anderson, as always, provided the musical entertainment. AFRH staff member Carol Mitchell told many jokes — some of them assuredly were bad on purpose, giving Carol the benefit of the doubt! 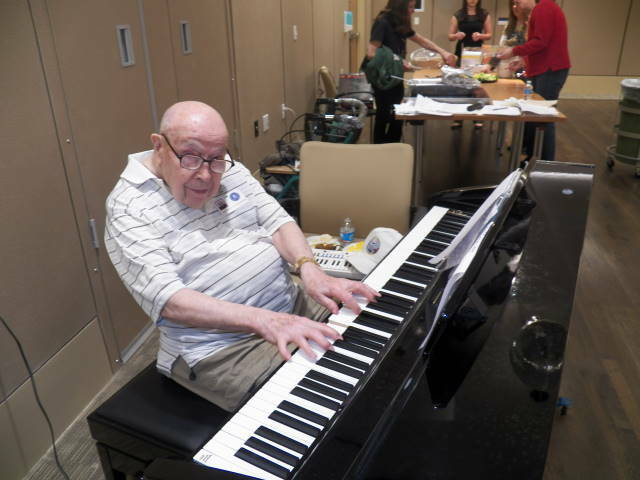 Residents enjoy the March 26 Happy Hour celebration where Friends of the Soldiers Home volunteered. Armed Forces Retirement Home staffer Carol Mitchell helps resident Martin Tobiessen celebrate his birthday at Happy Hour on March 26 at the Home. 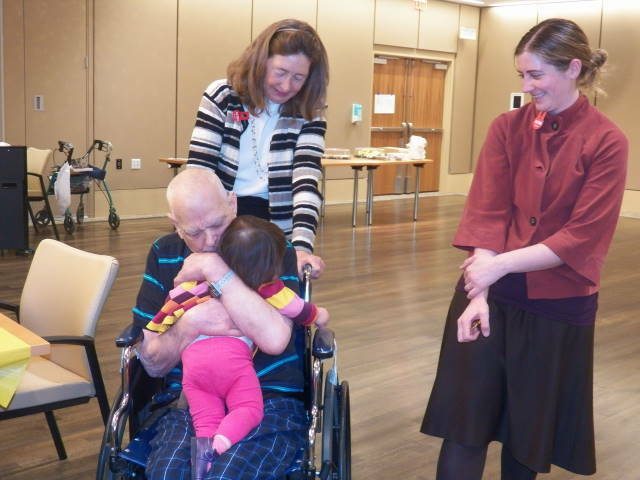 Resident Bill Conrad hugs the daughter of Friends volunteer Tailynn Olvera, right, while Friends volunteer Liz Cocke prepares to push Mr. Conrad’s wheelchair.